NEW HANOVER COUNTY, NC – A lightning strike is suspected to be the cause of a house fire in Figure Eight Island early Friday morning. According to Ray Griswold of New Hanover County Fire and Rescue, the fire started in the attic of a residence at 9 Clamdigger Point and eventually spread to the third floor. Griswold said no one was home at the time of the fire, and there are no reports of injuries. According to Griswold, the first call about the fire came in at 5:12 a.m., and emergency crews could see flames as they crossed the bridge heading into Figure Eight Island. 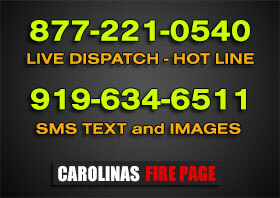 Emergency crews from New Hanover County, Wilmington and Pender County responded to the fire. Officials believe a lightning strike from a storm Thursday afternoon may have smoldered. The owners of the home live in North Wilkesboro and have been notified of the fire, Griswold said. BRUNSWICK COUNTY, NC – Investigators say a grill is to blame for a fire overnight that destroyed a home and damaged several others in Sunset Beach. Sunset Beach Fire Chief Kevin Dempsey says the fire started when a grill with hot coals tipped over near some grass and hay. He says the wind helped spread the fire, which reached a gas tank that blew up. Dempsey says two people were in the house when the fire started. They are going to stay with friends for the time being. Brunswick County Fire Marshal Scott Garner said there were no reports of injuries. The call came in at 2:12 a.m. in the 1300 block of East Main Street. Firefighters say the home was engulfed in flames when they arrived. They say it took an hour to get control of the fire, which was still burning hours later. Crews plan to knock down what’s left of the house today. Two other homes are inhabitable for now, investigators say. Another home was damaged in the fire. In all firefighters evacuated six homes while they battled the fire.